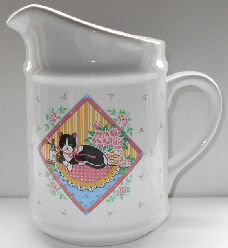 Here is a ceramic pitcher for milk, cream or sauces. The pitcher is 5 7/8" high x 4" across the bottom not including the handle. Previously owned but in good condition.